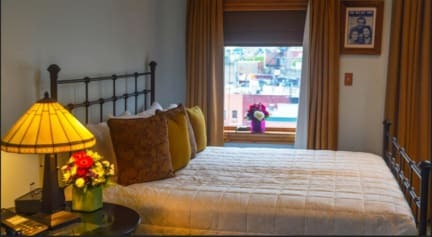 Blue Moon Hotel NYC i New York, USA : Boka nu! Overall I highly recommend this hotel/hostel! Well kept, organized and lots of nice amenities. The room was like a normal hotel room with bunk beds. And in great shape. My only feedback is the lights in the room. I recommend that an additional small light be installed that's away from the beds. The current lights are very bright and if you turn them on, they are like spotlights on each bed. Otherwise, thank you for a great stay! Fräscht och rent med trevlig personal. Möjlighet till mat då samma ägare även har café i samma byggnad med samma entré. Väldigt nära till tunnelbana och bra matställen i Little Italy. It's important to note that this is a hotel with a few dorm rooms, not a hostel. 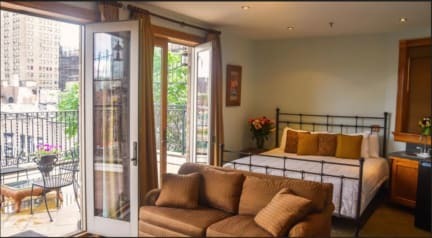 Because of this there is no real common area and no kitchen to use, but if you know all this then this is one of the best places to stay if you're only in NYC for a couple days! The area has a lot of restaurants and is close(in NY standards) to most of the main attractions. My one nitpick would be that the blankets are too thin, so it gets cold if you're staying in the winter. Other than that I highly recommend it! It was VERY cold, cockroaches on the floor and we were six persons that had booked a six bed dorm but they were unable to place us all in the same room.